Heat oil in skillet over medium-high heat. Cut tortillas into wedges with scissors. When oil is hot, fry wedges until golden brown. This will only take a few seconds, so watch closely and remove quickly to plate covered with paper towel to absorb excess oil. While they’re fresh from cooking, sprinkle with cinnamon sugar if you wish. 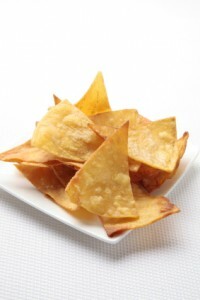 This is the only kind of semi-homemade tortilla chips we make. They used to serve them at our favorite Mexican fast food restaurant for dessert, and when they were discontinued we started making our own!